We've all heard the saying "You can't manage what you don't measure." While this isn't a new idea, it is increasingly becoming more important in our marketplace. The revenue cycle management (RCM) and small medical practice worlds are beginning to see how Big Data can help them. In short, many billing companies have begun to view themselves as RCM companies, given all that they do to manage all aspects of a practice's revenue. 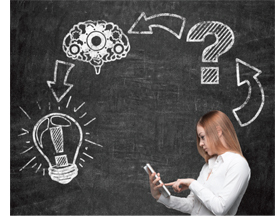 With that has come the need to provide business intelligence to providers. Business intelligence can be delivered in a few ways through custom dashboards and customizable reports. In the past, a good business intelligence tool could cost an organization a few hundred thousand dollars. Now these tools are much more affordable and easier to use. When used properly, these tools will pay for themselves – several times over. And you'll have several functionalities to choose from. For example, financial dashboards are now able to display trending revenue. You can use filters to break down the different practices your company works with at the provider level, carrier level, or by location. These dashboards can also track payments, breaking them down by month or as a year-to-date comparison. They can show the year-over-year percentage change in payments and review charges, adjustments, and billing encounters. Many dashboards will even show financial summaries and A/R buckets. Data dashboards allow you to be proactive in knowing the health of your RCM group and your clients' practices. I have heard of a physician who, prior to partnering with an RCM group, tracked the health of their practice by looking at its bank account. Now you can deliver easy-to-digest data to your clients that is much more reliable and proactive than if you were to simply look at a bank account. Because of how the technology is set up, dashboard software providers can load external items into the dashboard. For example, you could have Medicare's RVUs loaded and updated in the system. Many groups currently track the changes to RVUs manually for the physician, which can be time consuming and worrisome because you need to feel confident when providing this data to your client. By uploading this data into your system, you can give a report to the provider and their RVUs for that month to accurately pay the other physicians according to their production within the practice. Data dashboards also let you show your practices their payor mix. This will help you guide the practice with scheduling and what types of patients they should be looking for to ensure they are running efficiently both for the health of their patients and their practice. 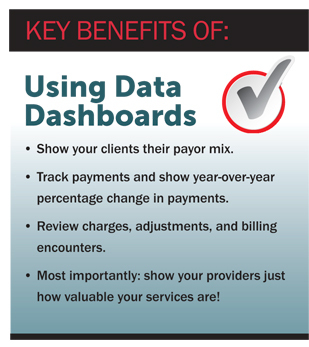 Most importantly, data dashboards let you show your providers just how valuable your services are. They also give you a way to stand out from your competitors. You can give the practice access to the dashboard so they are up to date on the financial health of their practice. This is a significant step to help you manage less with more and provide information to your clients so they can make informed decisions for their practice. As an RCM company, you can also collect more of the reimbursement and show your providers where their money is coming from and how it was collected. All things equal, if you were competing against another quality RCM company, you can show the practice how this data sets you apart from the competition. When choosing a dashboard, make sure it lets you distinguish between the entry date of a charge and service date. For example, let's say it takes a provider a couple of weeks to send you charge slips. It would be important to show on the dashboard the entry date of the claims rather than service date because your A/R buckets would show you a couple of weeks behind. The provider could think that you are sitting on charges, when in fact you have been waiting to get those charge slips from his or her group. You could also use this data as a means to discuss other ways to get the charges from the provider, so the provider doesn't wait as long to receive payment from the payors. You also should look for a system that can help you benchmark your practices according to HIPAA guidelines or gives you the ability to benchmark across their client base. If the vendor doesn't have this capability, find out if this will ever be possible and if there is a timeline. If they do offer this functionality, have them show you step by step what it would look like and take to create these reports so you know if this will really take time out of your day and benefit both you and your clients. Also ask them what reporting measure they suggest you track so you know all the benefits of this technology. Data dashboards can also help you help your company. It is very difficult to pull data for all of your clients so you can see how you are doing as an organization. Data dashboards let you easily access this information. I have spoken with several billing company staff who say they take hours to create custom reports for their doctors every month. How much is your time worth? How efficient are your employees? Do your clients know what they need to do next to grow their business? Our industry is feeling increased pressure to do more with less reimbursement than ever before. Data dashboards and business intelligence aren't silver bullets, but they do give you the ability to get more from lower reimbursements. The market is evolving toward business intelligence and it is up to the software vendors to ensure that they are answering the market demands and provide the billing and RCM companies with the tools they need. Make sure you partner with a vendor that has this vision because the change is happening now. Are you prepared? Chris Cotton lives in Salt Lake City, Utah. He works at ADP AdvancedMD as a district manager working with RCM groups.